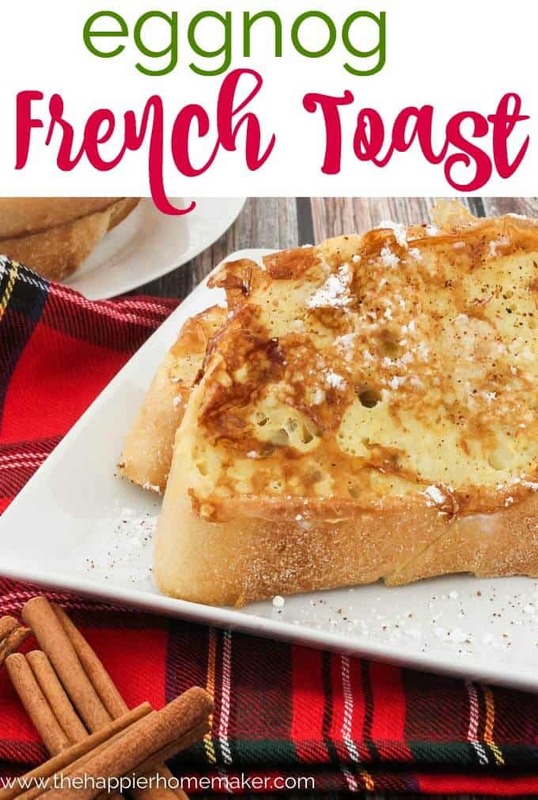 I love French Toast-I can remember my mom making it for me Christmas mornings and special occassions when I was growing up. Now that my three sons are getting a little older and less picky (my youngest is 4 and oldest is about to be 9) I’ve been trying new recipes with the hopes that they too will one day look back fondly on those favorite holiday meals. 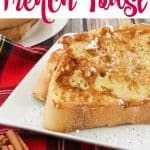 I recently converted a traditional Egg Nog French Toast Recipe to a fun, slimmed down, dairy free version using Silk Soy Nog and it couldn’t have been more delicious! Preheat a griddle to 350 degrees. Whisk together Silk Dairy-free Nog, eggs, and nutmeg. Pour into a casserole dish. Place bread slices in the mixture, pressing slightly in the middle to help the center absorb the liquid. Flip and repeat on opposite side. Spray griddle with nonstick spray and transfer coated bread slices to the griddle. Cook until surface is golden brown, about 3 minutes, then flip and repeat. Serve immediately with powdered sugar, cinnamon and maple syrup if desired! Using thick bread and really saturating it in the nog mixture is the key to making this dish extra special! 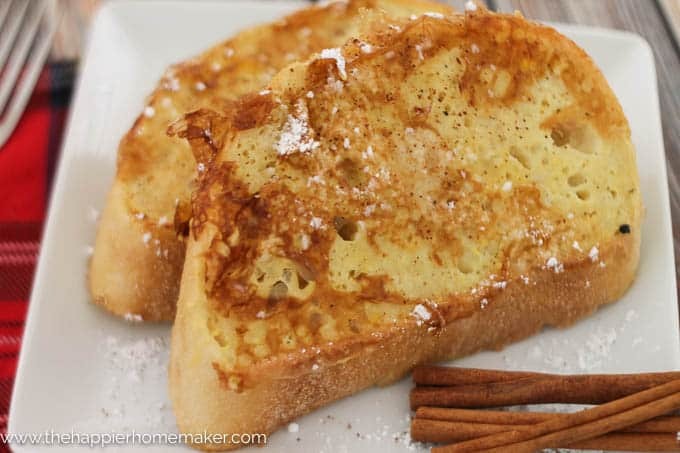 We’ll be having this Eggnog French Toast again on Christmas morning but next time I’m going to use the Silk Almond Nog in Pumpkin Spice! Yum! Do you have any favorite Christmas breakfast traditions? 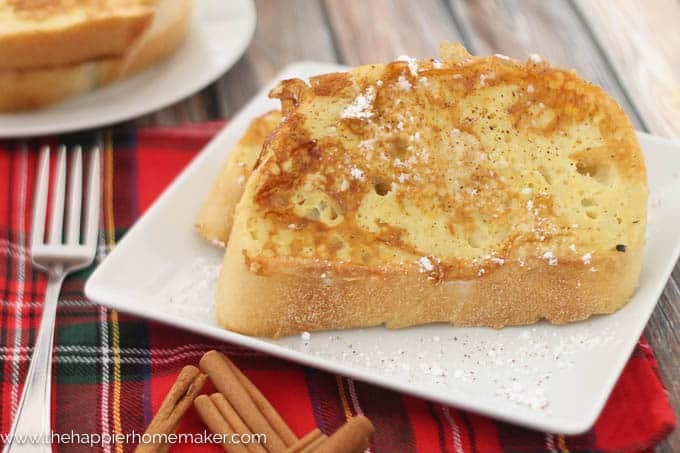 Delicious holiday twist on traditional French Toast using Eggnog! Preheat a griddle to 350 degrees. Whisk together Silk Dairy-free Nog, eggs, and nutmegg. Pour into a casserole dish. Place bread slices in the mixture, pressing slightly in the middle to help the center absorb the liquid. Flip and repeat on opposite side. Spray griddle with nonstick spray and transfer coated bread slices to the griddle. Cook until surface is golden brown, about 3 minutes, then flip and repeat. Serve immediately with powdered sugar, cinnamon and maple syrup if desired!